IMPORTANT NOTICE: "Lost and Found" party goers are not allowed to book this apartment. This cozy seafront apartment is situated in St. Paul's bay. As you can easily see from the photos, this apartment offers amazing views of St.paul's bay. It is also close to all of your needs. Restaurants, bars, and stores are all close by. 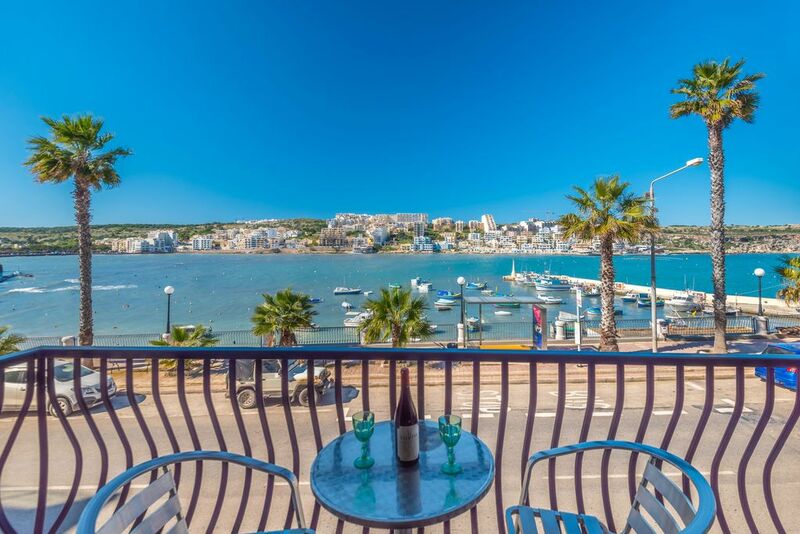 This lovely two bedroom apartment is located on the seafront in St Pauls Bay. The view from the balcony is enchanting. The apartment is nice, served by lift and located directly on the seafront. The apartment has a large balcony overlooking the spectacular bay of St Paul's, which is characterized by the traditional colourful Maltese fishing boats called the ‘luzzu’. There is also free WiFi in the apartment. The apartment is fully equipped, highly finished and furnished. It has two bedrooms, a shower and a spacious kitchen dining living room with a balcony overlooking the sea. The kitchen is well equipped with refrigerator, freezer, cooker, toaster, kettle, all necessary cutlery, and dishes. In the living, there is a nice sofa and satellite television with over 1,250 channels to choose from. In the apartment, you will also find a washing machine, iron and ironing board & fans in all the rooms. It is very relaxing and romantic to sit in the living room or on the balcony to enjoy dinner facing the sea and at the same time watch the sunset. - Please note that in the weekly price of the property Water and Electricity are included with a generous limit. electricity. The guest will just pay what they consume. We are a family business that offers comfortable and luxurious holiday accommodation in Malta since 1981. The business is now run by the second generation and are full time on these properties and thus can offer the best service and 24/7 support. We are fully dedicated to our properties and guests. We are always a phone call away and try to be as helpful as possible. We offer and can give information before clients come to Malta (or on arrival), both about our properties and about Malta in general. We offer to book airport transfers by taxi or minibus at the best prices by trustworthy drivers. We offer to help book car hire at the lowest prices. Also we can arrange for motorbike, mountain bike, and boat hire. We also can arrange fishing trips with full time and part time fishermen. On arrival we meet you personally at the property and see that all is up to your satisfaction. We also offer to give you tips for your holiday according to the season and your likes and preferences. During your stay we offer 24/7 support, a fast maintenance and replacement service should anything go wrong in the property. All our properties are by far the best kept as we do an ongoing maintenance. Also the properties are licensed and insured for your piece of mind. This property is in a quiet area of St Pauls Bay. The more tourist areas of Bugibba and Qawra are 15 minutes on foot. Parking is much easier in this area and so ideal for those renting a car. The bus stop is just in front of the apartment block and reaching the North and South of Malta is easy. The view from the balcony and front room of this apartment is enchanting. Guests fall in love with the view and area and many return. The view at night of most seafront properties is pitch dark sea. This apartment enjoys the reflections in the sea of the lights of opposite Xemxija coast. Thus we named it Harbour Lights! This property also enjoys a small swimming area just 150 m away which is ideal for a quick swim after a day sightseeing or for a morning reviving swim! We are full time on our properties. We also have employees who help us with the managing of the apartments. Thus you can rely on a 24/7 assistance and professional accommodation. Equipped with electric shaver socket, hot and cold water, linen basket, and towels. Shower has a stool for the elderly. Most extra facilities can be arranged on request and all at cost price. Internet connection is provided free of charge. Fishing trips, speed boat trips and boat charter can be arranged. Taxi transfers are entrusted to a serious taxi driver Also I can take care of car hire at the cheapest price. Swimming can be done in a small bay just 100m from the apartment. The best sandy beaches are all 10 min by bus away. Also one can take one day cruises from a nearby jetty. Swimming in winter can be also done in heated pools around the island. If you are interested in some activity in Malta kindly do not hesitate to ask for information. I will do my best to give you information about it. Malta is super, the appartment was as per the photos, the owners are very gentle and took care of us during the time spent there. The bus line is right in front of the appart so it was easy to visit the Island. We were there for 2 months and discovered plenty of nice places during all that time. Thank you for your review and rating. Hosting you was our pleasure too. Indeed the bus stop is close by and the amenties close by too. The view is superb and guests can reach out to us at any point during their stay. We invite you to be back soon! We stayed here for a long stay from January to March and it was a great location for us. We did not have a car and did not feel a need for one. We loved the views from the balcony and watching the fishing boats coming and going. Within walking distance we found restaurants, shops and banks. The bus stops right outside the door are very useful for going further afield. Neville and Ruth were perfect hosts and couldn’t be more helpful. They always responded immediately to any queries we had and were always available to offer advice when needed. We feel the success of our 3 month stay is due to their professionalism. Thank you and we plan to return next year. A view that you will never tire of. A modernised 2 bedroom apartment, with 2 single beds in each, with tiled floors throughout in a convenient location for local bars and restaurants and a view that is relaxing both day and night. The picture attached is NOT the apartment we actually stayed in but another owned by the same landlord further up the bay. Thank you for your review! Yes in fact as you stayed in Blue Harbour apartments just few meters up the road due to some works we had to do at Harbour Lights apartments. Blue Harbour and Harbour lights are very similar apartments in the same location with same facilities and specifications. We have many apartments in Malta and we are full time on our properties. To make sure we give always the best service we have our own maintenance staff with vans full of spares, stores full of spares, our own representatives/hosts to welcome you at the apartments and be there should you need any assistance, our own cleaners, office staff personnel that are available 7 days a week and 2 emergency phones that are on 24/7 should you need our help. Self catering apartments do not have a reception. However on arrival departure and any day you need anything you will find our friendly and dedicated representatives/hosts. Our office staff are reachable by phone, SMS, Whats App (free WiFi in all apartments), email and Facebook. Thank you again for having been our guests. We hope to see you again soon! Good comfortable accommodation with wonderful views. Everything we needed was at hand and transport was literally on our doorstep. We love Malta and will certainly return. Only 2 negatives - firstly the noise from the road is huge which disturbs the tranquil setting. secondly you need anti mosquito sprays - its the time of year really but the mosquitoes were awful day and night. Eu poderia listar varias coisas que nos deixaram bastante frustados, mas apenas gostaria de dizer pra não repetirem o meu erro de deixar para a ultima hora. Agendem com antecedência que poderão encontrar apartamentos muito melhores nessa mesma faixa de preço. El apartamento está bien cuidado y muy limpio. El apartamento tiene un balcón frente al mar una de las mejores vistas de Maltas y encantadoras luces del puerto reflejando en el agua. Las fotos en el anuncio son tomadas por mí mismo utilizando una cámara barata, para asegurarse de que mostrar como es y por lo tanto los huéspedes tendrán expectativas realistas. Mis representantes, mi personal de mantenimiento y yo Neville están en la cuadra cada día y hablamos muchas veces durante su estancia. También tenemos servicio de emergencia las 24 horas del día, 7 días a la semana y 14 horas al día. Usted nunca nos dijo de ningún problema excepto sobre el problema de Internet que afectó a todos los bloque, como el módem y routers se quemó debido a un aumento de potencia. Como sabes, resolvimos el problema en 12 horas (era domingo por la noche). El lunes por la mañana el Internet estaba de vuelta a la normalidad mientras que vamos un técnico para solucionar el problema. Nuestros precios han sido los mismos durante los últimos 5 años y cada año verificamos que somos competitivos incluso con apartamentos que no tienen una vista tan bonita! Estamos contentos de que siempre estamos completamente reservado y creo que estamos muy bien de precio. Su reserva fue en agosto, que es el pico de la temporada alta, así que no puedes esperar precios bajos. Estoy seguro de que confrontado los precios antes de hacer la reserva, y ya que era un gran grupo el precio por persona era muy bajo en comparación con un hotel. Si bien estamos seguros de haber hecho todo lo posible para hacer sus vacaciones r y alojamiento lo más cómodo y perfecto posible, le deseamos todo lo mejor. The apartment is well kept and super clean. The apartment has a seafront balcony one of Maltas best views and lovely harbour lights reflecting in the water. The photos in the advert are taken by myself using a cheap camera, to make make sure we show it as it is and thus guests will have realistic expectations. My representatives, my maintenance staff and myself Neville are in the block every day and we spoke many times during your stay. We also have 24/7 emergency service and a 14 hours a day open office. We spent 5 days in the apartment, with my elderly parents. We chose this apartment because of the lift, the bedroom layout, and of course the wonderful view. Steph met us on arrival and quickly showed us round. The apartment was very clean and, after opening all the cupboards, we found sufficient towels and blankets. I really don't think that more than 5 people could stay comfortably in the apartment. it was quite windy during our stay and warmer blankets/quilts would have been welcome, as would a bath mat in the bathroom because the floor is slippery when wet. The sliding window on the balcony didn't close properly so there was a constant draft which was a nuisance and the fact that the apartment was not securely locked was annoying. There was also a problem with the water draining from the shower tray which no doubt could be fixed with a plunger. There are no shops nearby, but fortunately we had a car so that wasn't a big problem for us. It would have been a nice touch to provide some basic groceries i.e. bread, jam, coffee, tea, sugar, milk. I would also suggest that it is time to renew the bed linen which is rather tired. The Harbour Lights apartments are in a quiet area of St Paul's Bay. The more tourist areas of Bugibba and Qawra are 15 minutes on foot. Close by, there is bus access to all the major sandy beaches in Malta, such as Mellieha Bay, Armier Bay, Paradise Bay, Golden Sands, Gnejna Bay, and Ghajn Tuffieha. However, if you would prefer hiring a car then free-on-street parking is available. - Country walks at 500m.